This is a NEW class for younger students. It is a slower pace and we will go over many basics in Minecraft. Each week a special assignment is set up for the kids to challenge themselves. They will be solving problems and using their "earned" treasures to build, explore and create. 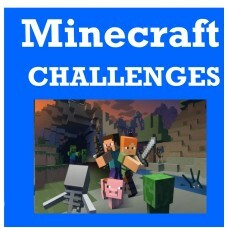 Kids can have fun and learn skills of strategy and team building while playing Minecraft. The Minecraft Challenge allows the students to work on a secure server with only students attending the camp. The kids are monitored. No subscriptions needed! We provide logins required. The kids are using an .EDU version of Minecraft that has awesome MODS and many extra features. If your child wants an introduction to Minecraft or you are looking for a safe, supervised way for to them to enjoy the BEST game-this class is it! No prior experience required.